Skull Candy iPhone App: Sweet or Sour? Anytime I come across an iPhone application that I’m vaguely interested AND is free, I download it. So when Skull Candy – the brand known for obnoxiously colorful, but admittedly stylish headphones – came out with a free app last month that promised free music, videos and “up-to-the minute” snow, skate and surf conditions, I was all about it. After playing around with the Skull Candy app, though, I found my cranium a bit sore and my pallet a touch too bitter. The app's wallpapers feature is a cool add-on. Just don't expect anything without a Skull Candy logo on it. In theory, the app is genius: Reach out to a young, emerging generation of snowboarders, skaters and surfers by offering a one-stop app that includes an extreme-sports blog, free videos, a music player and a system that generates the conditions, directions and forecasts of places they can shred at. Unfortunately, the majority of music is terrible, the videos aren’t worth wadding through and the app is one giant Skull Candy ad after the next. If the snow section worked correctly I could probably find some redemption in the app, but this is where things truly go sour. Conditions for most Tahoe resorts are updated about every morning. 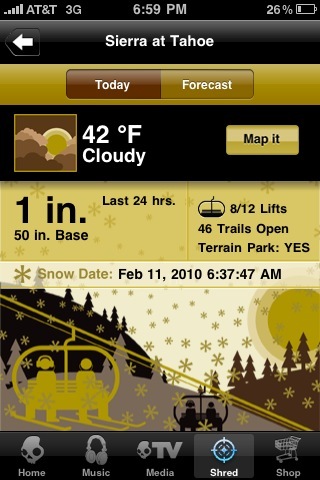 All of the snow conditions are powered by onthesnow.com, but they are far from up-to-the minute. Most Tahoe resorts appear to be updated once every day or less, and sometimes it’s even tough to get conditions this fresh. For each resort you choose, the app shows the “current” weather and temperature, amount of snow-fall over the last 24 hours, a six-day forecast, the mountain’s snow-base level and the number of lifts and trails open. While all these functions are great, they’re almost never as up-to-date as the conditions that can be found on each of the resort’s websites. Yuck. Six-day forecasts are provided for every resort, but are not always up-to-date. The search engine for finding places to ski and snowboard is one of the few bright spots that works as it should – and it includes over 2000 international resorts. You can search by different US regions and states, as well as various countries throughout Canada, Europe and the Southern Hemisphere. Another cool feature is that you can pinpoint search areas by radii ranging from 5 miles to 500. Be wary of the “map it” button, though, which sometimes shoots you way off course from the resort you’re trying to reach. When I tried to map Heavenly, for example, it gave me directions to the Eldorado National Forest, more than 30 miles southwest of the resort. Even stranger (not to mention frustrating) is that every time you map a resort, the app transfers coordinates – instead of a normal address – to the iPhone’s maps application. It’s head-scratching lags like this that ruin the potential of this app. Skull Candy had some great plans in mind, but in the end, an app that could have made a positive mark on the snow, just left a big yellow one. Tasty.